Maynard Owen Williams, 1929 National Geograpic magazine, January. If the pen is mightier than the sword, Turkey is on her way to new victories. The entire nation is relearning its A-B-C's, having discarded the 482-letter combinations of the Arabic script and adopted in their stead 29 characters (including those with diacritical marks) from the Latin alphabet, in use throughout the Western World. 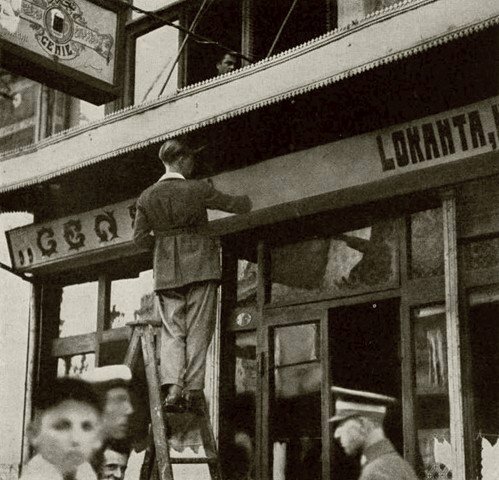 - This Constantinople shop displays its name in Old Turkish (Arabic script) above and then repeats its name in the recently adopted New Turkish (Latin letters). 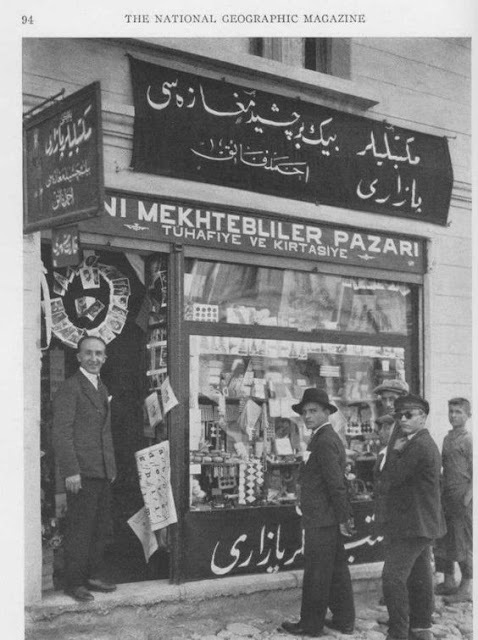 Both proclaim the fact that this is the “New Book Store.” The shop is one much frequented by Turkish schoolboys, and its proprietor has been conducting a thriving business in the sale of new alphabets and primers during the last few months. - A restaurant near The Galata Bridge changes its sign to the New Turkish alphabet. 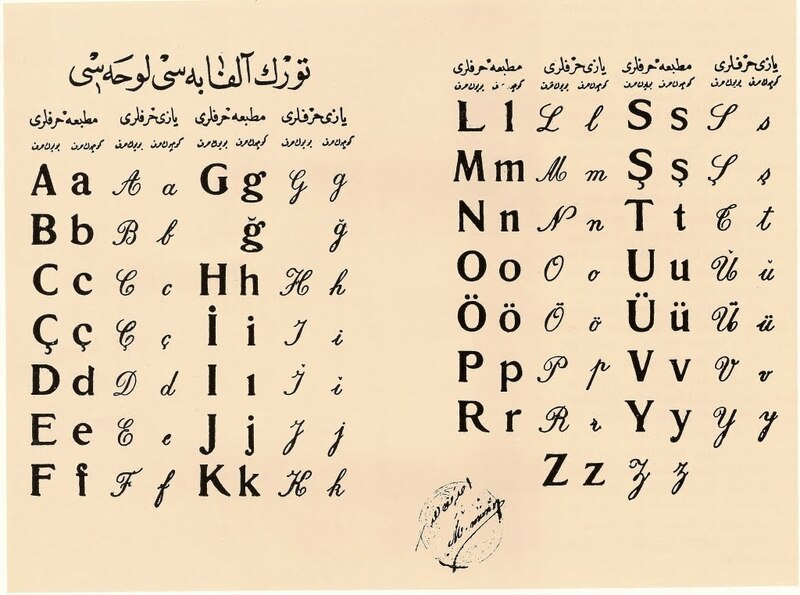 The new system of writing in Turkey has affected not only the cheaper signs, but imposing and costly brass and bronze inscriptions in Arabic script are being discarded and replaced with names in the Latin alphabet. 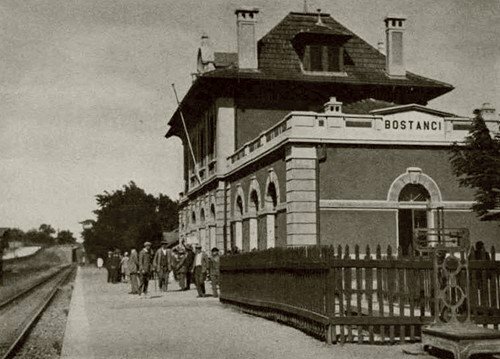 - Bostandji gets its name painted on the station in New Turkish. As printed, the “dj” becomes “c,” which has the “g” sound in “George.” This is a suburb of Constantinople. - A Turkish coach starts on its run across Asia minor. The destination, Adana, is indicated in New Turkish. - In leisure moments this shopkeeper studies his A-B-C’s. - The new alphabet displayed near Stamboul post office. - He has spent most of his life making Turkish seals. At his age he now finds it necessary to learn the Latin characters of the New Turkish, and, in common with many thousands of others, is already able to write his letters. The author had him make a seal with initials in Latin characters and with Istanbul and 1928 in Arabic-script Old Turkish. 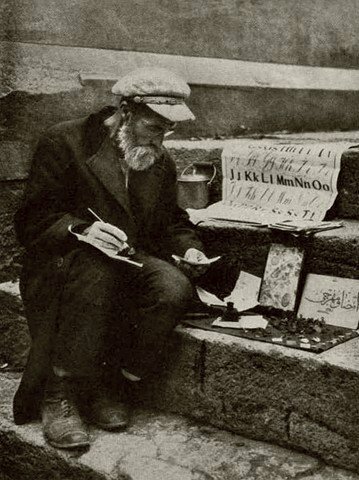 Beside him are some blank seals and his engraving tools and behind him is one of the New Turkish alphabets. - The transition period in the Turkish language. 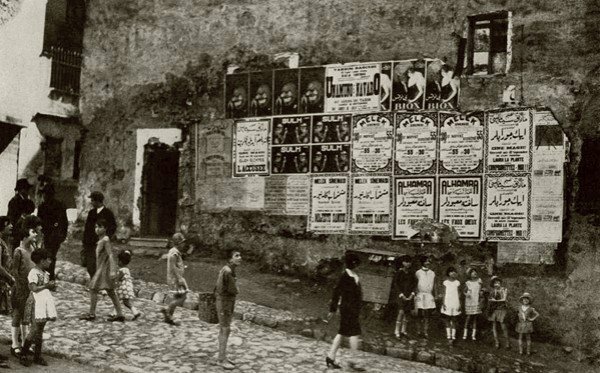 Moving-picture theaters announce their attractions in posters which are printed in Arabic script and in “New Turkish,” as well as in French. The Alhamra (the”b” was dropped when its name was put in the new alphabet) flashes on its screen every week a humorous story in New Turkish. - The best seller in Turkey to-day is the new alphabet, but this one is not for sale. The storekeeper has turned the space in front of his shop into an impromptu classroom. - A sign painter reletters a barber-shop sign. 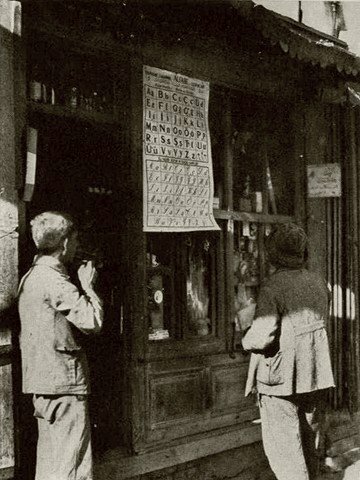 An advertisement in the Old Turkish writing (Arabic script) may be seen above. Perukhari, meaning “barber,” sounds more like a wig than a shave. 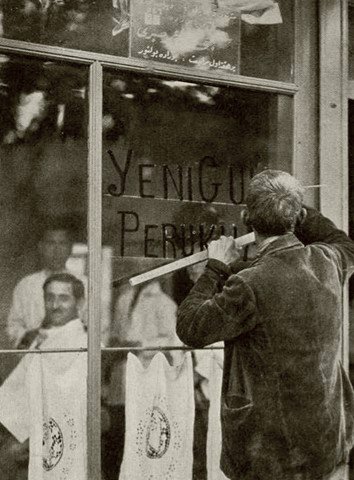 This is a busy time for sign painters in Constantinople. - Informal classes and self- instruction are to be seen everywhere. 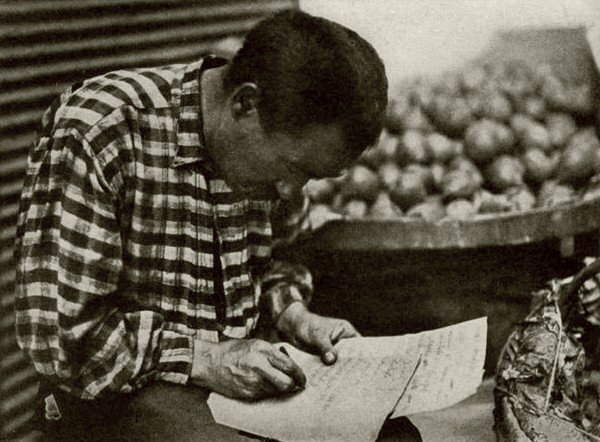 This man is only a seller of green groceries, yet he is toiling away on the New Turkish script and numerals. Turkey is one vast schoolroom, but the formal schools did not open last autumn until several weeks later than usual, because new texts in the Latin characters were not ready. 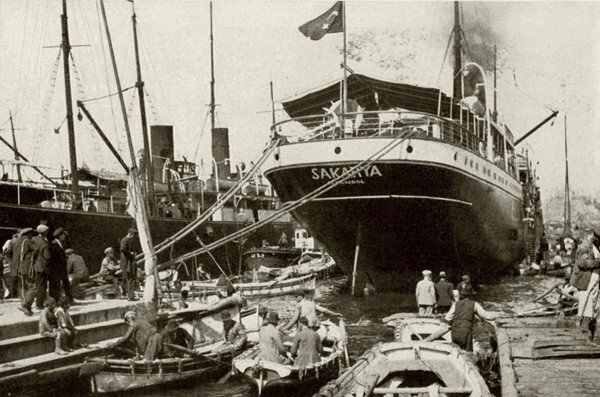 - A Constantinople wharf scene with the name of the “Sakarya” in Latin characters On this steamer the name of the city is spelled “Istanbol,” although the accepted spelling a few piers away is “Istanbul.” Such discrepancies are not unusual. - A department store puts on a primer class in its show windows. Each of the new A-B-C’s is used as the initial for some familiar object chosen from stock. 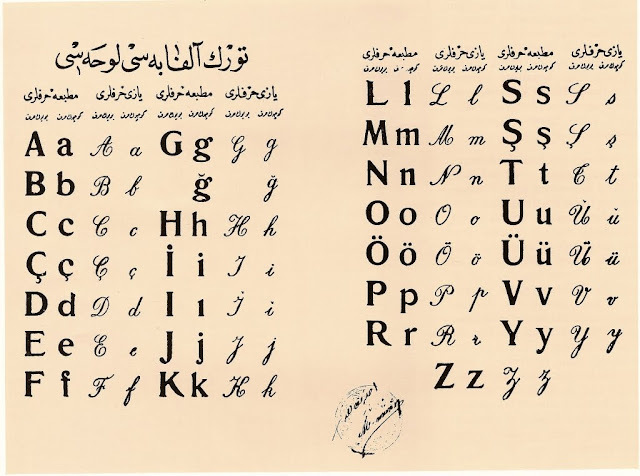 There are 29 letters in the New Turkish alphabet, as follows: a, b, c, ç, d, e, f, g, ğ, h, ı (without a dot), i, j, k, l, m, n, o, ö, p, r, s, ş, t, u, ü, v, y, and z. One of the “i’s” is dotted, both as a capital and as a small letter. The other is not dotted, either as a small letter or as a capital. The Turkish lacks our q, w, and x. Several signs in the Old Turkish characters hang above. When the schools closed for vacation last spring, there was little thought that the adoption of the "New Turkish alphabet" would delay their fall opening until textbooks could be prepared, so that all instruction would be in Latin characters. But the "New Turkish," no longer a joke, has been taken so seriously that a new humorous weekly, the Khahaha the k is silent-which appeared in September, was the first periodical to be printed entirely in the new characters. On December i, all newspapers were compelled to appear in the new alphabet, else suspend publication. The Government had to assist some papers to buy new type. The Arabic script, apt medium for Moslem art, presented tremendous difficulties to the student; so that more than four-fifths of the Turkish people were illiterate. Time and again I have found cultured Syrians, Arabs, and Turks unable to decipher the calligraphy which was both literature and art throughout Islam. Is it any wonder that the nearly 500 letter combinations of the Arabic script have long daunted worker and peasant? In front of the highly revered tomb of Eyoub Ensari, standard bearer to Mohammed the Conqueror when he took Constantinople, there is a beautifully carved grill, bearing a wonder-working Arabic inscription. Mothers, pressing their palms upon it and then rubbing the faces of their children, keep its surface brightly polished. Yet few can read it and I have found none who can translate it. Cultured Americans who have lived for decades in Turkey cannot read the names of the landing stages on the way to their homes on the Bosporus. Men who can converse fluently in several languages can not read the street signs in the land in which they have lived for years. But within the last few weeks a vast change has come. Early in August, on what seemed frivolous occasions, at one of which he praised Western music and Western dancing, the President of the Turkish Republic. 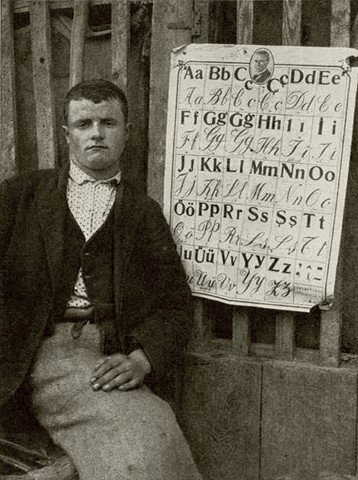 Spoke in behalf of the new alphabet, whose adoption, like the coming of the millennium, was then something to be considered, but not worried about. As if by magic, however, names in Latin characters appeared on a dozen or so Turkish steamers in the harbor. As I passed along the quay of Galata Bridge, on August 21, a whole set of names was there, ready to be fastened to the prows of local steamers. I longed for my camera, which was miles away. On the bridge itself, boys were selling copies of the new alphabet. On the steamer, with a ten-cent primer in hand, I learned more Turkish in an hour than I had known after a year in the country. 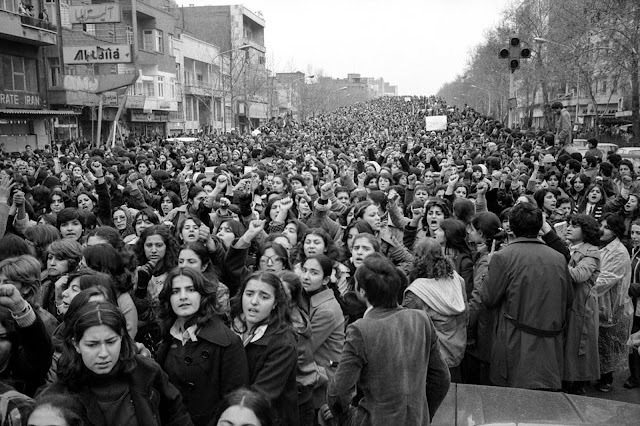 Although the popular enthusiasm is great and opposition negligible, it was a change imposed from the top-not enforced by law, but inspired by the President. At a banquet, while making a speech, he would hand his manuscript, written in "New Turkish" to some sluggish bureaucrat who felt secure in his job, and ask him to read it. Sweat glands were overworked last summer. One such application was enough for that officeholder. The morrow found him feverishly studying his A-B-C's. One after another, the ministries are adopting the new alphabet for all official correspondence and none seems eager to be the last. The lowliest functionary must know how to read and write Latin characters or be booked for dismissal. In a country where even college graduates consider a "Government job" a worthy prize, this method makes inertia seem less organic. In the foreign-language newspapers a section on the adoption of the new characters soon became as much of a fixture as a comic strip or sporting page in the United States, only that it is "first page stuff". In the Turkish papers and magazines columns or entire pages were printed in Latin characters weeks in advance of the official order for their use exclusively. The new alphabet was "news", not for amusement, but for study. Advertising columns have become primers, picturing well-known objects whose Turkish names begin with the "new" letters. Window displays show the entire 29 new characters as initials for various objects chosen from stock and mounted on the same card with the initial and the full name in the new characters. On the street cars the old bilingual signs in Arabic-script Turkish and Latin-lettered French have given way to clearer signs in New Turkish, which is equally easy for the foreigner to read, even if the "d" and "t" and the "b" and "p" seem to be juggled somewhat and cedilla and umlaut markings are added. There is no q, no w, no x in the new alphabet adopted by the Turks. The left-hand edge of the typewriter is the hardest hit. One does not go to the "Maxim" Restaurant, but to the "Maksim." The most revolutionary change I noticed was the "BURSA," on the name plates of Broussa automobiles, and when I asked why, my informants assured me that "BURSA" came closer to the phonetics of the one-time capital than does the French form "Broussa." other only five minutes away calls itself "TELGRAF". But such trifling matters may soon be righted. Ten months ago the aid of several experts in Angora was enlisted to obtain data for the New Map of Europe being prepared by the National Geographic Society, on which each nation is to have its own place names. A partially satisfactory transliteration was the result. With the newly adopted alphabet, however, the place names of Turkey will be standardized within a few weeks. In the post office my registry receipts are now made out in legible New Turkish, but receipts written three months ago were unintelligible not only to me, but to my Turkish-speaking assistants. Foreign firms in Turkey have hitherto been forced to keep their books in both forms of numerals and in two languages. Books can soon be kept in one language, only a few Turkish trade words being necessary for the foreigner in order to make his records conform to Government requirements. Although the change is not made with an eye to the foreigner, travel for us has become vastly simpler, and Turkey has taken on a less forbidding air, as station names in Arabic script disappear. Travelers on the Orient Express or the Anatolian Railway were formerly forced to judge their position by consulting a watch or a sextant. They can now read the station signs. 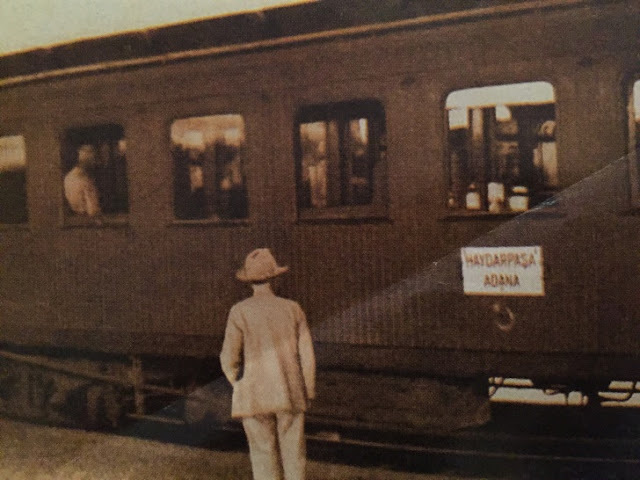 On the sides of the Turkish cars, as well as on the International sleeping cars, the names of the termini are marked so plainly that even he who runs to his train may read and catch the right one. To the foreigner some of the changes seem to have been made wrong end to. The name on his steamer has been painted in Latin characters, and the number on the funnel is the un-Arabic "Arabic" numeral, to which the West is accustomed. But the time-table and the list of stops made by that particular boat are still in the old characters. Meanwhile the correspondence of the shipping company is being done in the new characters, and the Turks are only awaiting the arrival of typewriters with the newly adopted Latinized keyboard before business correspondence will become legible, if not understandable, to all. 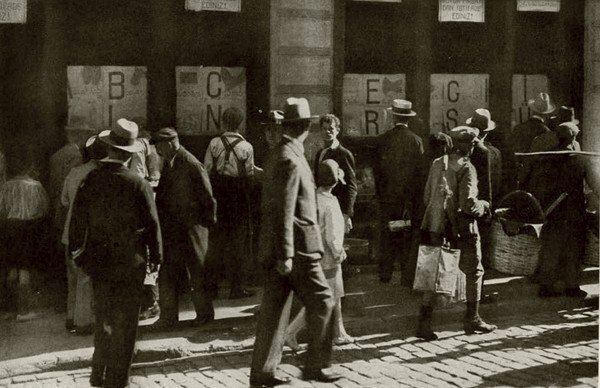 One striking feature of the revolutionary change in alphabet was the way it caught the foreign firms napping, so that they now lag rather than lead. Sewing machines, automobiles, oil and gasoline, breakfast foods, and cleansers still retain the Arabic script in their advertising and on their products. An "ESSEKS" advertisement is the only one of its kind that I have so far noted. Although one moving-picture theater half-heartedly uses Arabic script for its titles and every week flashes a funny story in the new alphabet on its screen, thus starting such a course in concerted title reading as "movie" fans have always had to endure, the cinemas have largely adopted the new alphabet. The "interior," as Anatolia is called by the Constantinopolitans, is out speeding the former capital, and Stamboul seems to be more affected than Pera (the European quarter), where bilingual signs in old Turkish and French, English, German, or Russian were common. 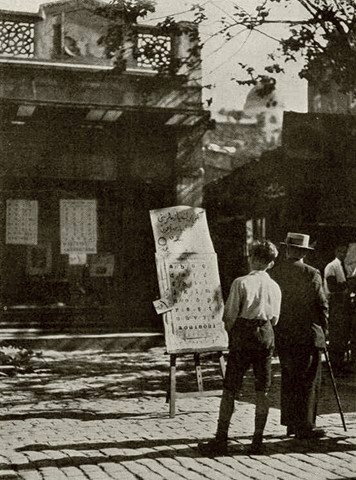 The blackboard and copy book have become major equipment in post office, police station, store, and bank. But the classroom is wider than that. Miles out from Broussa, while waiting for the Cape Town-Stockholm Motor Expedition, I was asked to read an entire column printed in the new alphabet and was assured that what I read made sense, though not to me. Cafes, ferries, and street cars are all improvised classrooms of this nation at school. An American moving-picture man, with a flair for the dramatic, found a group of turbaned Moslems studying Latin characters on tombstones in the English cemetery. In the porch of Yeni Djami the professional scribes have mastered the new script and are ready to save backward bureaucrats from downfall. Near at hand, but facing starvation, are the seal engravers, whose involved inscriptions, like a banker's signature, are models of studied illegibility, but who will find it hard to make even a monogram as attractive in the new characters. What the effect on Moslem art will be none can say. There are rumors that the great decorative inscriptions by Tekhedj Zade Ibrahim and others will be changed, which is a little like making over a Raphael or a Michelangelo on a typewriter. Many of the mosque inscriptions are in the Arabic language as well as Arabic script, and hence have no direct relation to the present problem. Iconoclastic enthusiasm for the wonder working "New Turkish," which is to awaken a nation from illiteracy and backwardness, may even touch some Arabic inscriptions whose beauty in a house of worship has seldom been equaled and never surpassed. But if one fears that, he can go out to Stamboul's Sistine Chapel-the one-time Church of St. Saviour, now the Kahrieh Mosque-and see Christian mosaics and frescoes in an edifice rebuilt by Justinian. As Moslems come to prayer they cross a vestibule on whose ceiling the miracles of Christ are still pictured, although human figures on wall brackets have been destroyed by iconoclasts. As yet there is no indication that this movement toward enlightenment through a more easily understood alphabet will result in the destruction of art treasures whose fame is worldwide. If the splendid calligraphy which so dominates Moslem art from ceramics to architecture now ceases, existing treasures may be valued more than ever. New Turkey is definitely stepping away from other lands where the Arabic script still prevails, just as she slid when she abolished the fez and tried to free women from the veil. But this may prove a link rather than a breach. Persia and Afghanistan are already following the superficial changes which Turkey recently adopted. Second-hand Prince Alberts may find as wide a market as did second-hand hats and caps when the fez was removed. Safety razors are pushing their conquests farther east on a wave of Turkish nationalism. Only a few years ago Turkey was nominated as an American mandate. She is now eagerly adopting changes which no foreign tutor would dare impose, and is winning a cultural leadership far beyond the Ottoman boundaries. That an eastern land is now modernizing and westernizing the Near hast at a pace such as no Western nation or nations ever set is just one of those paradoxes in which history delights. Suffering from no oppression psychosis, the Turks freely accept what no outsider could impose. With the adoption of the New Turkish alphabet, a nation is going to day school and night school. Having withdrawn his capital into the heart of Anatolia, the Turk has not only retreated from the intrigues and indignities of the past, but has carried Western modernism-for better or for worse-into regions little touched by Occidental culture. Yet, in making his fight for the New Turkish alphabet, the President of Turkey invaded the foreign-language, foreign-press, foreign-thinking city of the Sultans. The tool he uses is not the sword, but the pen-that and the stub of a pencil that the grizzled mail messenger grips in his cramped fingers, as he sits on the lower deck on a Bosporus "chirket" and painfully learns to write a script which will take a letter to any country in the world. Source: The National Geographic Magazine, January 1929.